15 TMC members or attenders and 3 guests joined us for our first TMC membership meeting on January 21, 2018. We glanced back over the past several years, looked forward to our 2018 lineup of events, and opened the floor for discussion of several issues. 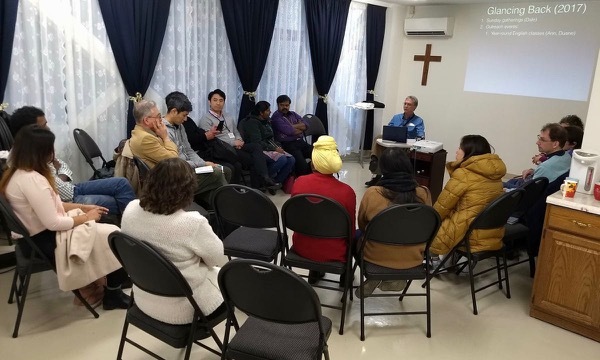 As a result, we decided to share testimonies during worship services twice a month, start some Sunday afternoon small groups once a month, and add a second worship service that would be in Japanese when we reach the seating limits of our rental facility (probably about 50 people). We hope members will take increasing responsibility in decision making as TMC defines and refines its leadership structure. Membership meetings will probably be held 2-3 times a year, with non-members usually invited as observers. The Lord has financially provided for TMC’s rental facility through the giving of Sunday worshippers and the financial partners who have contributed to our ongoing TMC Fund within our EFCCM Ministry Enhancement Fund. 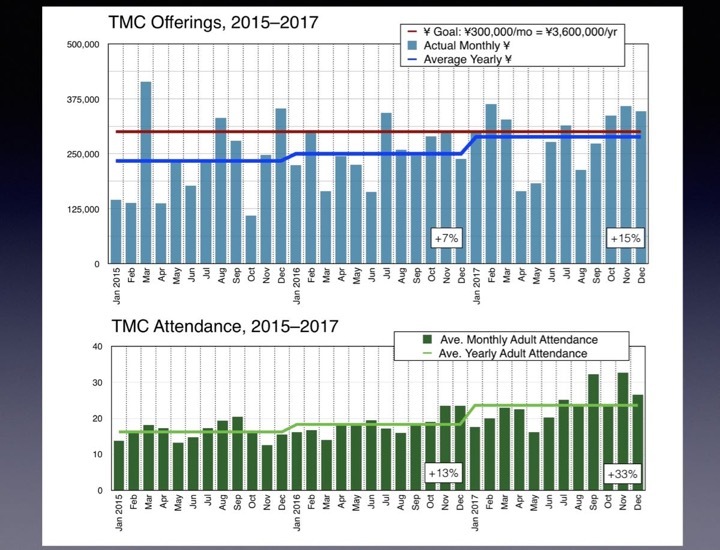 The purpose of the TMC Fund is to cover a gradually decreasing portion of TMC’s rental facility costs during the church’s early years as TMC gradually takes on full responsibility for covering those costs. We are thankful that by the end of 2017 TMC attenders were covering almost all of TMC’s monthly rental facility costs! If we don’t need the TMC Fund for TMC#1 in 2018 we hope to use it to begin building TMC#2’s launch fund.